As promised in my late November 2015 review of the Fostex PX-5HS active speakers here we have the isoAcoustics Aperta isolation stands. These stands are an excellent physical match for the Fostex speakers though not ideal with my regular stand mount speakers that are too narrow. In order to evaluate these stands I set them up with the Fostex PX-5HS speakers on each end of my regular equipment rack as you can see in the picture above. The Aperta155 stands allow the user to tilt the speakers in any direction, they are fully adjustable for level up to 6deg. In my setup I kept them level as the speakers looked right and during my listening sessions I found no reason to change the setup. The isoACOUSTICS isolation stands are available in a range of sizes and configurations to match different speakers. I particularly like the look of the Argosy Spire iStand, these are available in either 36inch or 42inch height and two widths with the isolation mount built into the top. The frame of the Aperta stand is made from aluminium nicely finished in black or silver with patented isolation between the upper and lower frames. 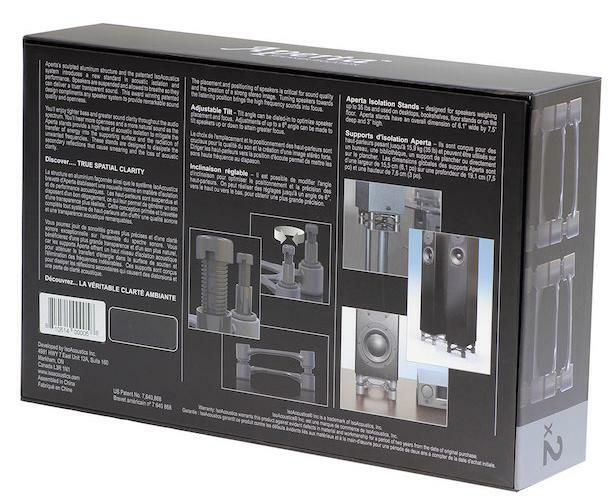 The isolation system provides a solid foundation for the speakers front to back whilst at the same time damping the vibrations generated in the speakers in the vertical direction. I am used to free standing speakers either on stands or floor standing, firmly spiked through the carpet to the wooden floor boards. The Fostex PX-5HS speakers sitting on top of the isoACOUSTICS Aperta stands on my rack is far from the regular speaker setup in my room, but it works really well. The proximity of the speakers to the pre-amp (MFA Classic) allowed me to use short (1m) balanced cables and I am sure this aided the clarity of the resulting sound. In this configuration the Fostex PX-5HS seemed far cleaner and more transparent sounding than when sitting atop my regular stands and in free space. 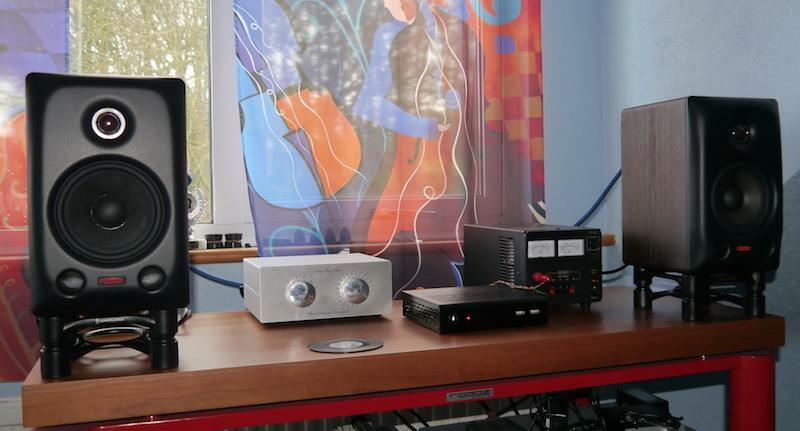 The rest of the system consist of the MFA Classic pre-amp, aqua acoustic La Voce DAC, PC running Audiophile Linux with music stored on a Synology NAS. The analogue source is my new Pre-audio ASP-1501 turntable (review to follow), Benz Micro Wood cartridge and PS30R phono stage from Whest. These isolation stands are not going to make any difference to the balance of the music, the high frequencies, versus the mids and lows remain the same. What the Aperta stands do is to clean up the sound, improving the focus, allowing you to hear deeper into the sound stage with a better 3 dimensional presentation. It did not matter what source I was using, the effect was always the same. The musicians were easier to discern and the timing of the music was better to my ears in my room. To provide a wider evaluation I next fitted the Aperta isolation stands under a pair of Demand Better Audio Envy 3 custom speakers I have on evaluation at the moment. These speakers came with a granite slab that sits on my carpet on which the 4 carbon fibre pads sit and then the spikes from the speakers rest, this provides a very firm foundation for the Envy 3s. 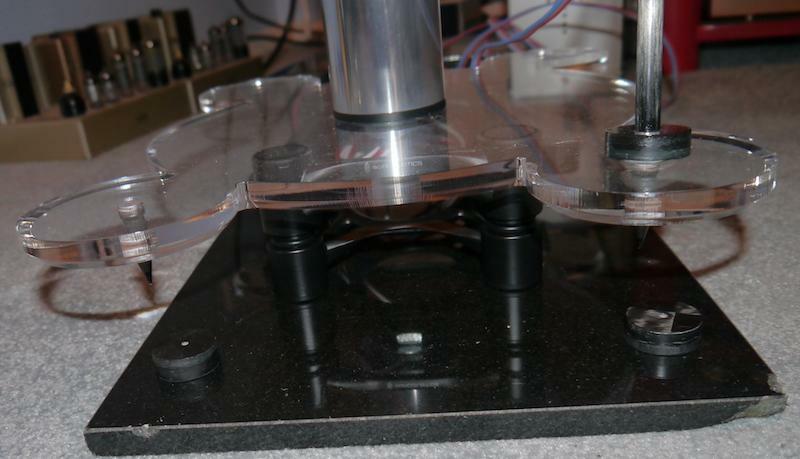 This arrangement may look a little odd but the speakers are stable and it is easy to detect the Aperta stands are working by resting your hand gently on the acrylic base and feeling the vibrations transmitted from the drivers. Now rest your hand on the lower section of the Aperta and the vibrations are mostly gone. The impact on the music is much the same as with the Fostex PX-5HS, a cleaner presentation. With the more extended output of the Envy 3 there is less coupling to the floor which cleans up the bass. What the Aperta stands is doing is damping the pistonic vibration in the vertical direction whilst providing a solid support in the horizontal direction. In practice the Aperta stands I have for review are not really the ideal size for the DBA Envy 3 speakers so the affect is reduced as the speaker is less stable in the horizontal direction. Even so the sound improvement is evident and if these were my speakers I would look at sourcing the configurable version of the IsoAcoustics isolation stands. The concept of sitting a speaker on a platform that damps the vibrations from the speaker is not new, Max Townsend has been making a living from it for a number of years now. 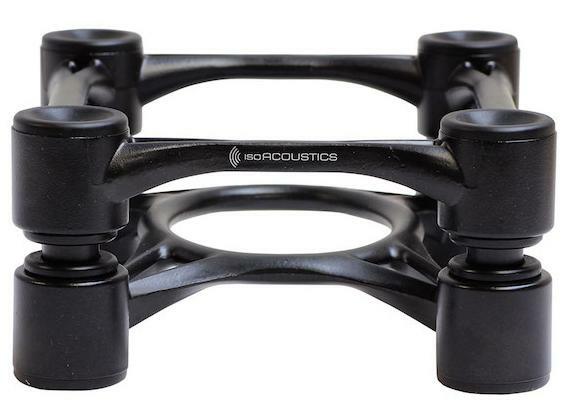 What we have from IsoAcoustics is a damping stand at a reasonable price that really works and looks good. The impact of the Aperta 155 stands on the Fostex speakers is significant, the pairing deliver a most enjoyable and focused result. I have purchased them for my desktop system! Fitted under the DBA Envy 3 speakers the result are still good, though less so, due to the physical size mis-match. I really like the result, the clearer focus in the sound stage and tighter bass frequencies. You could say the bass is lighter, I would argue that you are hearing more of what the recording engineer intended and less of what the playback environment has added. If you have a suitable set of speakers give the Aperta 155 a go, I don't think you will be disappointed.